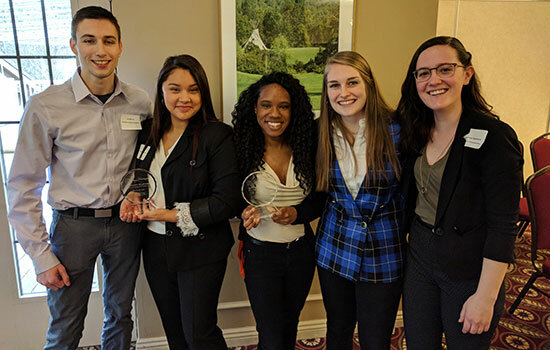 Winning RIT teams in the local chapter of the American Marketing Association's Student Marketing Competition (left to right): Joe Morone, Maria Tovar, Andrea Hubbard, Grace Blondell and Abi Van Nostrand. Two teams of students from Rochester Institute of Technology took first and second place Friday in the fifth annual Student Marketing Campaign Competition hosted by the local chapter of the American Marketing Association. A team from RIT’s Saunders College of Business finished first, and a team from RIT’s School of Communication finished second. Teams were tasked to come up with a marketing campaign to make financial firm Charles Schwab & Co. more known to millennials. Members of the Saunders team were Joe Morone, a fourth-year marketing major from Spencerport, N.Y.; and Maria Tovar, a third-year new media marketing major from Rochester. The team won $1,000, which will be used by the Saunders Marketing Club to further develop the club’s educational opportunities. Members of the School of Communication team were Andrea Hubbard, a third-year advertising and public relations major from Syracuse, N.Y.; Grace Blondell, a second-year individualized study major from Newark, N.Y.; and Abi Van Nostrand, a fourth-year new media marketing major from Ballston Lake, N.Y. The competition was held at Brook Lea Country Club in the Rochester suburb of Gates during a day-long conference hosted by the local chapter of the American Marketing Association.